Valerie Narumi is in the 6th grade and volunteers as our piano accompanist for the school’s Cougar Chorus. Outside of school, Valerie is an accomplished young pianist and composer. 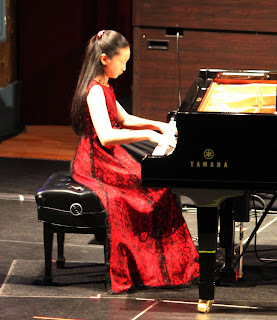 At the age of 10, Valerie achieved Music Teachers’ Association of California (MTAC) Certificate of Merit – Advanced Level in Piano Studies with Branch Honors, MTAC’s highest piano studies level and completed Yamaha’s Piano Performance and Fundamentals Grade 5 teacher level examinations in 2011. She has performed her original piano and ensemble works at Yamaha’s National & Regional Junior Original Concerts in 2005, 2006, 2008, 2009, and 2010 across the country and at the 2009 and 2010 National Association of Music Merchants (NAMM) Show in Anaheim, California. In 2009, Valerie organized and performed two charity recitals to benefit UNICEF and continues to volunteer and share her musical talents at various community events throughout the year. She has been honored with the President’s Volunteer Service Award, Gold Level from President Obama for her outstanding community service. In addition, Valerie enjoys playing the violin, figure skating, and art. Valerie was named a Shining Student for 2010 by OC Family Magazine and was featured in an article in the October 2010 Parenting OC Magazine. She aspires to become a medical doctor and to continue helping less fortunate children around the world with her charitable work and music.